Αυτη την εβδομαδα εχουμε flash sale σε πανω απο 10 προιοντα της OUKITEL, μπορειτε να δειτε αναλυτικα στην φωτογραφια. K10000 Pro and K10000 both gets 10000mAh massive battery which has been the world’s largest battery smartphone. These two models has been on hot sellers since release and performs quite good in battery life. According to OUKITEL, the third 10000mAh battery smartphone K10000 MAX will start presale in middle September. If you think K10000 and K10000 Pro is too thick for you, you should consider K6000 Pro and K6000 Plus. Large battery, fluent performance, good camera, high quality manufactured, these two models have been proved to be loved by many users. Dual-lens cameras surely takes better photos, U20 plus and U22 is a good choice for those who loves taking photos and selfies to share in social networks. Cheap smartphone can also take great photos and offers fluent experience while playing games, U20 Plus and U22 proved themselves. Large screen, large memory, if you care about storage as well as a big screen, you should consider these two smartphones. Similar price but different specs, U15S and U16 MAX gives different surprise too. Among entry smartphones, C5 pro and C5 is special in design and exciting in price. Comparing to other entry level smartphones, C5 pro and C5 performs quite good and is exquisitely produced. No matter for handling multi-tasks or play games, you don’t have to worry about lag in system. 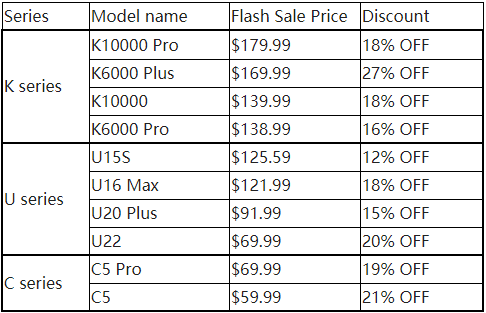 Up to 10 models which have been OUKITEL’s best sellers are sporting big discount during the Brand Flash sale, all by wallet-friendly price, all with limited stock and only held in limited time from August 29th to September 5th, take the chance!